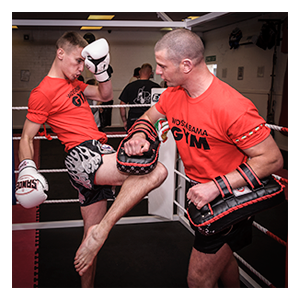 We offer a full grade syllabus to & conform to the Scottish Thai Boxing Association criteria for teaching and grading – the only club that does so in Ayrshire. Fully certified diplomas and recognized with the STBA. We hold a monthly grade on the last Saturday of every month for kids and adults. If you can’t make that we also offer at no extra cost a private grade / appointment every day of the week at a time that suits you. An armband (also known as Kruang Rang or Ring of Charm). A score sheet to show how well you scored and how you can improve on certain elements for next time. The chance of stardom as you feature in the local press ! Become and instructor and open your own club, we can help you achieve this dream (See staff for details).